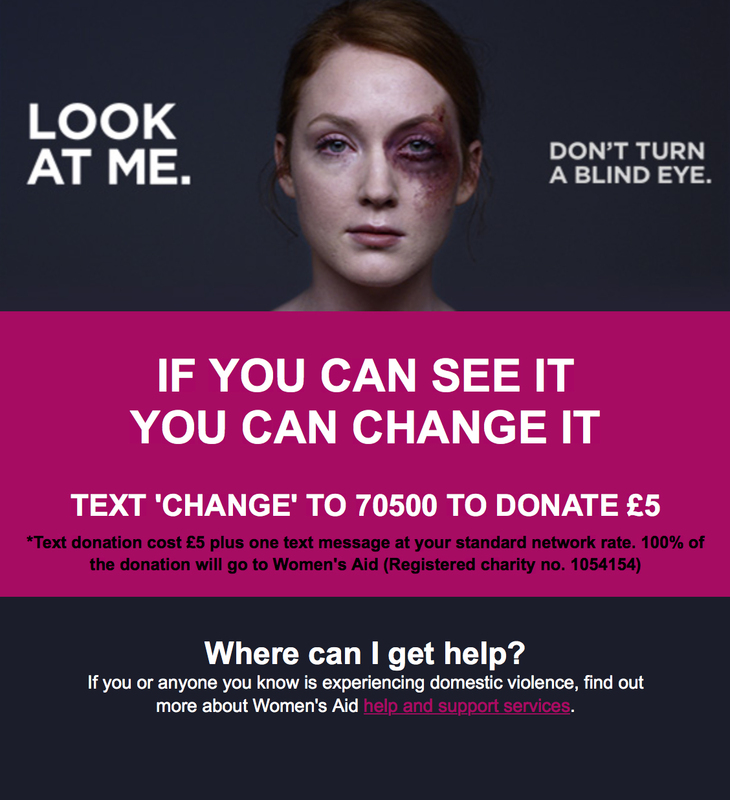 Women’s Aid, the British charity, is encouraging members of the public to recognise their role in ending domestic violence. A digital billboard featuring the bruised faces of women invites attention with the words “Look at me”. As pedestrians look at the billboard the bruises start to heal. The interactive billboard uses facial recognition technology to recognise when people actively pay attention. 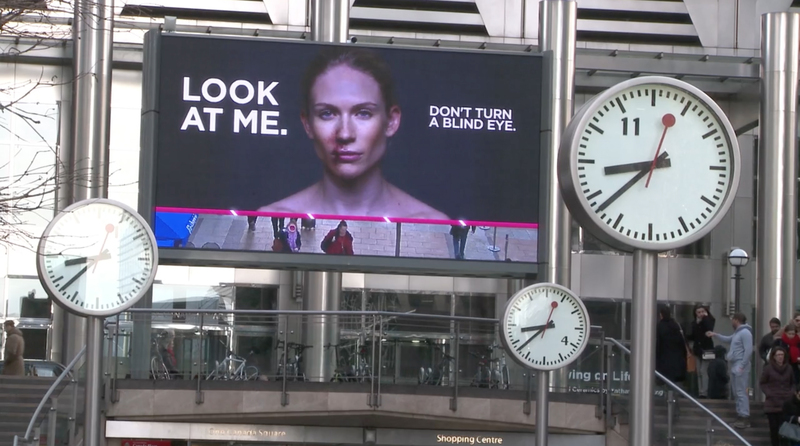 Those who look at the billboard get feedback via a live video feed that runs along the bottom of the ad as a visual ticker-tape, registering an increasing number of viewers. As more people take notice of the image of the women, her bruises slowly heal, demonstrating to passers-by that by actually taking notice they can help confront the signs of domestic violence by not turning a blind eye. 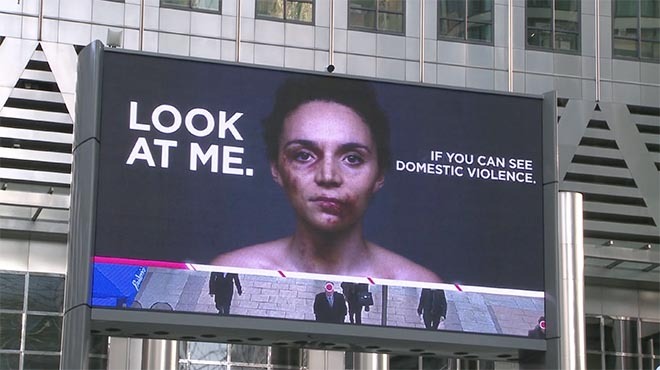 The billboard is being displayed over the weekend to coincide with International Womens Day, in London’s Canary Wharf business district, in two shopping malls, the Birmingham Bullring and Westfield London, on March 7 and 8. A related TV spot breaks Sunday evening on Channel 4. The Womens Aid interactive billboard campaign was developed at WCRS, London, by creative director Ross Neil, creatives Mike Whiteside and Ben Robinson, creative technologist Dino Burbidge, agency producer Sam Child, account team Torie Wilkinson and Katherine Morris, and planner Stuart Williams. Photography was by Rankin. Post production was by Smoke & Mirrors. Media was handled by Ocean Outdoor.